While everyone is all "pumpkin everything!!! ", I'm all about apples this fall. Applesauce, apple crisp, apple pie, hard apple cider, spiced apple cider, caramel apples. 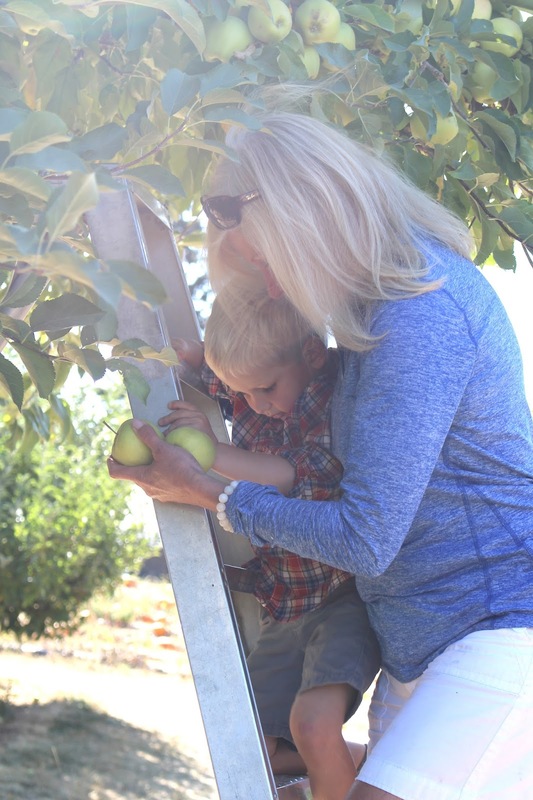 So when in Washington (the Evergreen State, not the Apple State...but still...lots of apples), I knew I had to take Liam picking. This adventure was about Nana & Liam. I love watching the two of them together; there is a real special bond between them. 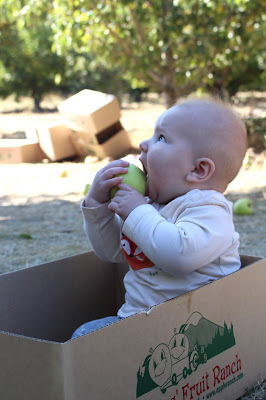 So while Finn sat in a box and tried to get an entire apple in his mouth, I captured these two very special people. Sometimes it's nice to be able to sit back & take in the moment, without being completely hands on. 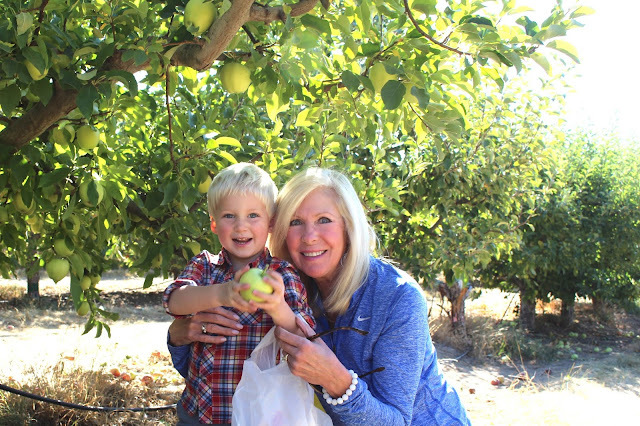 Liam could have picked apples all day, but at some point we had to cut him off because 20 lbs of apples was plenty! Climbing the ladder was the highlight, which we ever so patiently waited to use. Some older women were just monopolizing it and did not seem to care about the anxious little boy just staring them down wondering when they would be finished. 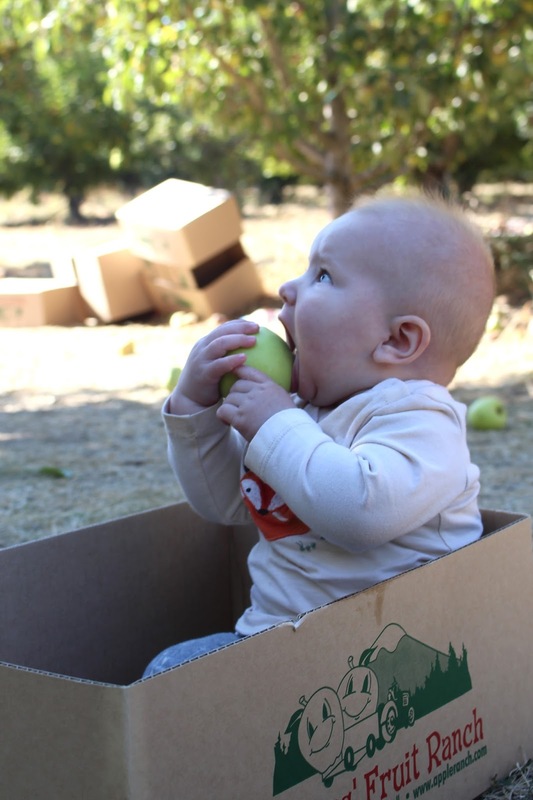 There was not much thought put into apple choice, mostly just whatever was in reach of little hands. It was much more about the experience than the outcome. The morning after our picking date, Nana & Liam made a fresh batch of applesauce. We used the Pioneer Woman's recipe, and it was amazing!!! I will be making another batch here soon, because I didn't get nearly enough during our visit. We used mostly golden delicious apples with a few honey crisp in the mix! Nana also threw together some homemade apple crisp during a nap time; she's pretty amazing like that. Apples all around! And of course, we didn't let this fun event go by without bringing home a few bottles of hard cider. I picked up a lemon basil summer cider that made my taste buds smile. I think we need to visit Spokane every Fall from now on! This is a tradition that must continue! So, I literally suggested apple picking to Chris on Friday, and he COMPLETELY shot me down. It looks so fun! This looks like so much fun! Love Finn in the box! I love apple picking!!! Love the ladder- what a great idea instead of having to stick to picking just the low ones! Carter picked way too many peaches in August so we went into apple picking with a cap! . And Finn in the box--cute! What a fun day - looks like a blast for all! Such a fun fall activity! What a fun day! Lemon basil summer cider sounds amazing! I really wanted to take Owen apple picking this year but we missed our window :( Might have something to do with the drought we're in but all the apples in our area were done mid September. Seriously so sweet!! Looks like everyone was enjoying themselves! What a perfect day! I'm allll about the apples, too - making apple crisp tonight and I can't wait! 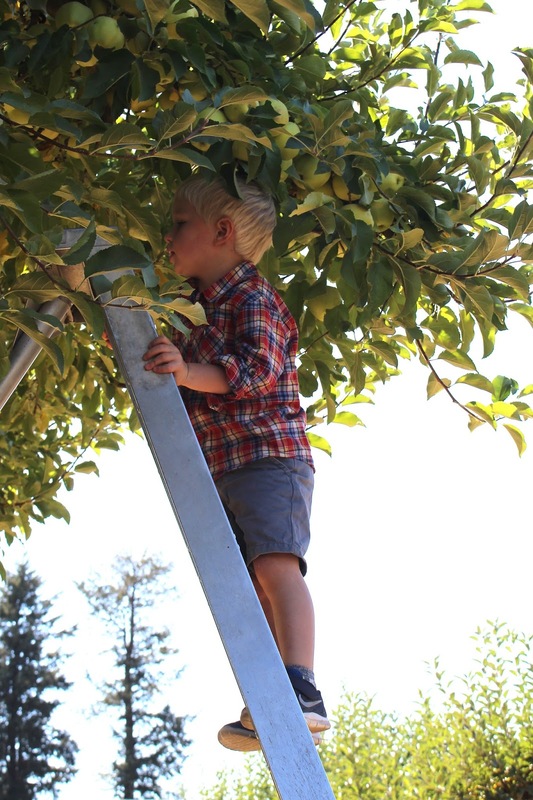 I'm jealous of apple picking! It looks like such fun. The closest we have is in Georgia. North Georgia. I told Chris we should rent a place for a holiday and go apple picking! Maybe in a couple years we can make it happen. Mmm apples. Oh he's so cute! Picking apples all day :) I love Finn's fox shirt too. How many lbs did you go through making the apple sauce? Bet you still have tons of apples left. Pumpkin everything? Meh, I could take it or leave it. Now, if they made an apple spice latte, I would be all over it! 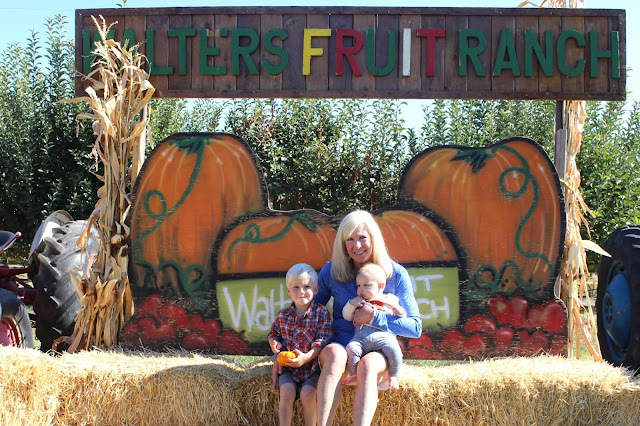 We just went apple picking here in Michigan where apples are "our thing" (haha) and we had a blast! Looks like your family did too! OMG apple crisp sounds amazing right now!!! I'm all about that. I like pumpkin but I'm not all pumpkin spice obsessed, especially on the PSL obsession. I do love me a caramel apple spice from Starbucks though! Apple picking is so much fun! We got some fresh picked apples this weekend, and splurged for some homemade apple cider donuts. Amazing! Awww, such beautiful pictures, it looks like so much fun! i am always all about apples! yum. i could eat apple pie errryday. lol. i want to go apple picking! Yum, I'm going to need to try out that applesauce recipe! We have soooo many apples, and the apple crisp I made only made a small dent :) The photos are beautiful as usual! Glad you had fun. Aww, love this! My little guy has a very special bond with his Nana, too! We wanted to go apple picking, but there isn’t an apple farm anywhere near us. Bummer. Looks like y’all had a great time and the photos are adorable. Isn’t Pioneer Woman the greatest? Such special pictures...Nana's are the best! We made apple crisp with the apples we picked, but I need to try the PW applesauce. Yum!! What a fun adventure!! :) All the hard cider variations you guys get sound AMAZING (are they store-bought or from 'breweries'? ), I need to be on the lookout!! Also, pinning that applesauce recipe ASAP.